In Time of Need provides a less stressful alternative to planning and arranging a shiva or memorial service. We take care of all the details. We are a full service company which lightens the burden for those who have lost a loved one. 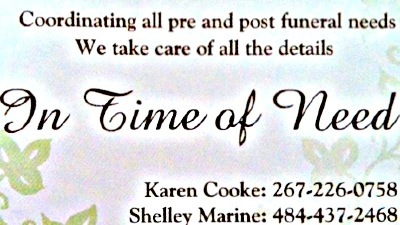 By coordinating and arranging all pre and post funeral needs, our clients can grieve and begin the healing process. In Time of Need helps ease your way through one of life's most overwhelming experiences. Allowing In Time of Need to handle all the details surrounding the pre and post funeral event permits you to begin the grieving process without the diversions that seem so insignificant in the face of monumental loss. However you choose to commemorate the life of your loved one, In Time of Need will take care of all the details.